This shows an image of a primitive meteorite* overlaid with a color image showing the chemical composition. Red represents aluminum, green represents magnesium, and blue represents calcium. The red/green stripes on the right side are an object called a chondrule. These are small rocks formed by some unknown event early in the formation of the solar system. Whatever the nature of the event, it produced a plethora of millimeter sized molten droplets that rapidly crystallized into spherical and nearly spherical shapes in outer space. The bar-like pattern you see in this chondrule tells us that it cooled much more rapidly than other materials, but not so fast as to form “dendritic” patterns which look like snowflakes. By understanding this chondule and others, scientists at SSL and elsewhere hope to reconstruct the tumultuous formation of our solar system. Someday we may even understand the formation of the planets themselves. * For folks interested in details, this meteorite is Parnallee, an LL 3.6. 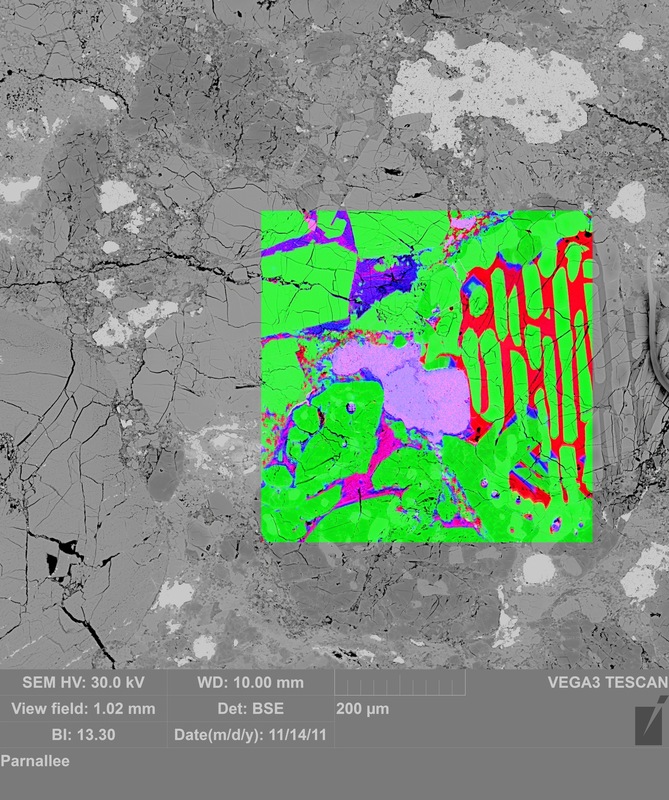 The B&W image is a backscatter electron image using the Tescan Vega3 SEM, and the chemical map was acquired using an Oxford X-ray detector. This entry was posted in research and tagged meteorites, planetary science. Bookmark the permalink.